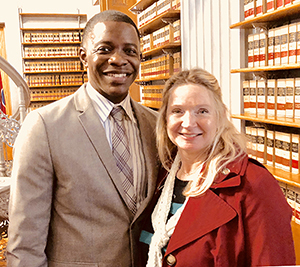 James Shaw, Jr., with CWA Local 3808 President Deborah Sisco after the ceremony honoring Shaw at the Tennessee legislature. James Shaw, Jr., a member of CWA Local 3808, heroically stepped in to stop a gunman during a shooting at a Waffle House in Antioch, Tenn. on Sunday. After the gunman shot and killed four people, Shaw wrestled the assault-style weapon away from the gunman, bravely saving the lives of many other people at the restaurant. Shaw, a wire technician at AT&T, was honored with resolutions in the Tennessee State Senate and House. "His actions on that fateful morning are unfathomable to most, indescribable by even the chief of police, and very poignant to the citizens of Nashville, who are deeply grateful for his brave actions in the face of extreme adversity that saved many lives," Tennessee State Senator Brenda Gilmore (D-Nashville) wrote in the resolution. "We are so proud to have Mr. Shaw as a CWA member representing labor in such a positive way," said CWA Local 3808 President Deborah Sisco. Since CWA's work helping customer service professionals at General Dynamics Information Technology (GDIT) fight wage theft gained widespread attention in January, more than 2,000 current and former GDIT call center workers have come forward to call on the U.S. Department of Labor (DOL) to investigate wage violations at the company. GDIT call center agents help Americans navigate Medicare and other programs, many of them doing jobs that require highly specialized skills. CWA filed complaints this week with the DOL on behalf of workers at five additional call centers, exposing GDIT for illegally misclassifying thousands of workers so the company could underpay them. "These complaints provide further evidence that thousands of workers at a majority of GDIT call centers across the nation are systemically underpaid," said CWA President Chris Shelton. "That's why we are calling on the Department of Labor to conduct an enterprise-wide investigation at GDIT." "I'm proud of the work that I do – helping Americans gain access to healthcare under the Affordable Care Act and Medicare programs," said Kelly Grove, an agent who handles Medicare claims at a General Dynamics CMS call center in London, Ky. "I love talking to the people we serve, I always remember to treat them with special care because they are somebody's grandmother or grandfather. But GDIT doesn't offer me the same care. They're not concerned about who I am or what type of service I'm providing." "Before we started organizing and coming forward about these issues of wage theft, GDIT made it seem like we were replaceable," said Tatiana Baez, who is a call center agent from the Tampa call center. "I am glad that we are standing together to make things better for my fellow agents who work so hard day in and day out." If the DOL confirms this widespread wage theft is occurring, CWA estimates that tens of thousands of current and former GDIT employees stand to recover more than $100 million in back wages since 2013, which would make it the largest federal contract wage theft case in history. 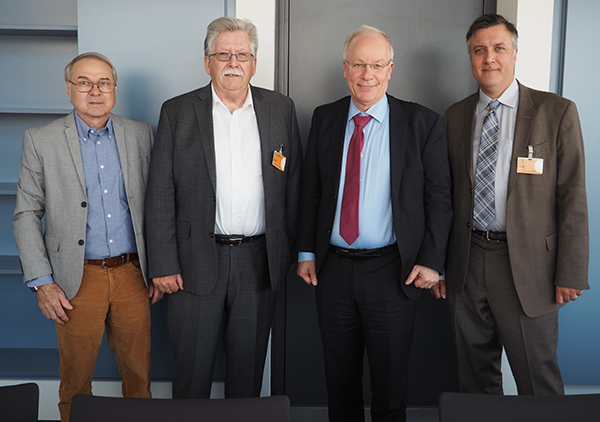 GDIT also has faced unfair labor practice charges for illegal threats, surveillance, and interrogation of workers seeking to exercise their freedom to join together and negotiate improvements in their wages and working conditions. Read the feature story in the Washington Post about GDIT's wage theft here. 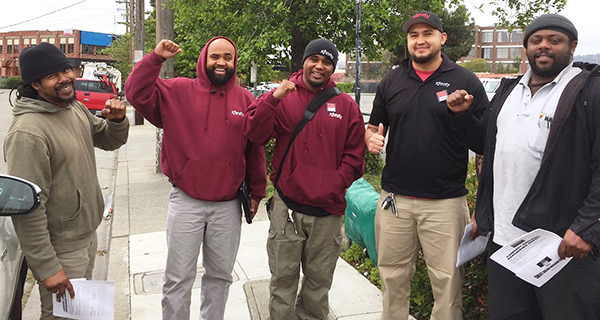 CWA Local 9415, based in Oakland, Calif., represents members in California and Hawaii at Legacy T, AT&T West, AT&T Mobility, Comcast, and other employers. As part of the CWA STRONG program, the local has focused their 2018 efforts on signing up new members and educating all members – from new members at DIRECTV to more senior members at Legacy T.
The local has raised its AT&T Mobility membership rate from 82% in December 2017 to more than 90% today. The local beat back a union decertification vote at Comcast, and has organized several new bargaining units this year. Local members are embracing the systematic, coordinated strategy for building their local they learned in District 9's CWA STRONG training. The local held a first-ever stewards' training this March in Hawaii, as well as a stewards' training in Sacramento, Calif., in January, with more training sessions to come. Local 9415 is a great example of the growing momentum in District 9's CWA STRONG program, and how CWA members are strengthening and building their union. The local's CWA STRONG efforts have been led by Coordinator Scott Turner and Organizer Yonah Camacho Diamond, with the support of Local 9415 President Coby Rhem and CWA District 9 Staff Representative Louis Rocha. CWA Local 9415 Comcast stewards are CWA STRONG. Contracts expired for 14,000 CWA members at AT&T Midwest and AT&T Legacy T on April 5. Workers currently remain on the job but are ready to strike if negotiations stall. A key issue at the bargaining table is keeping good, family-supporting jobs with affordable benefits and a secure retirement in our communities. CWA released a new report this week examining AT&T's continued role in hollowing out the middle class by eliminating thousands of jobs, closing call centers, and moving jobs to low-wage and overseas contractors. The report reveals the devastating impact of recent call center closures across the Midwest, including in Michigan, Ohio, Wisconsin, and Illinois. AT&T workers report that the company’s offshoring of U.S. jobs is not only harming workers, but it's also hurting the company’s quality of service. "I put in 20 years at AT&T, and then got laid off along with 116 of my coworkers 10 days before Christmas," said Sheila Lewis, who worked at AT&T's Detroit call center until it closed this year. "The way the company did it isn't fair or respectful. It's also bad business, because the overseas contractors doing our work cost the company money because of their poor service and harm to the AT&T brand." "AT&T got rewarded with tax breaks, but AT&T employees are getting hurt," said Tomeka Cooley-Pettus, a 13-year employee at a call center in Dayton, Ohio, where AT&T recently announced layoffs. Read more about the AT&T report at USA TODAY here. 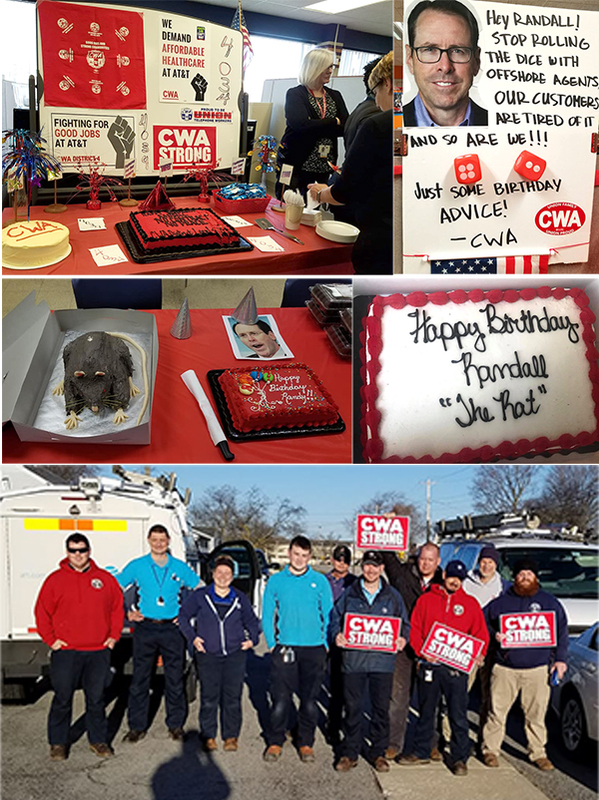 CWA members at AT&T Midwest including Locals 4034, 4324, 4621, and 4900, held actions to "celebrate" AT&T CEO Randall Stephenson's April 22 birthday by reminding him of the big promises he made in order to get the Republican corporate tax cut bill passed. Wells Fargo, the biggest beneficiary of the Republican corporate tax cut bill, is set to make $3.7 billion from the bill. Instead of passing that windfall onto workers or investing in communities, they're sending jobs to countries with lower tax rates and poorer working conditions. CWAers are fighting back. On Tuesday, the day of Wells Fargo's annual meeting in Des Moines, workers rallied across the country to tell Wells Fargo to stop offshoring jobs and keep call center jobs in our communities. CWA supports federal call center legislation, backed by pro-worker Senators such as Bob Casey (D-PA) and Sherrod Brown (D-OH) in the Senate and by a bipartisan group in the House, which would make U.S. companies that offshore their call center jobs ineligible for certain taxpayer funded grants and loans. The bill would give U.S. consumers a right to know where they are calling and to be transferred to a U.S.-based location, and create a public list of companies that offshore call center jobs. 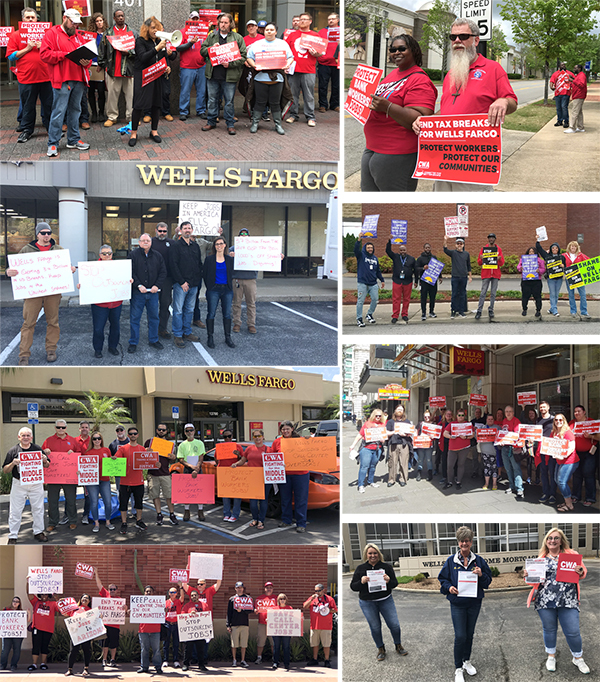 CWAers rallied across the country in Bloomington, Charlotte, Huntsville, Miami, Nashville, Phoenix, Seattle, and Springfield to tell Wells Fargo to stop offshoring jobs and keep call center jobs in our communities. In preparation for this week's special election in New York, CWA members throughout the state worked tirelessly for weeks — making calls and going door-to-door to talk to their neighbors and coworkers about the importance of voting for candidates who support working families. CWA helped deliver some incredible victories, and the hard work CWA members put in is going to have a huge effect on New York in the coming year. 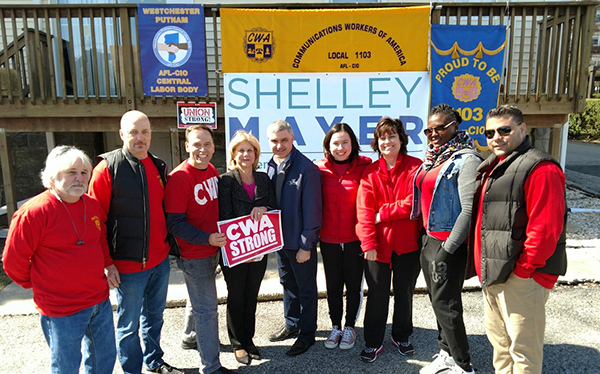 CWA members were proud to have played a role in Assembly Member Shelly Mayer's (fourth from left) election victory for State Senate. She has stood with CWA on every issue. She's fought for working families and advocated alongside CWA for FiOS build out across New York State, Safe Patient Handling, opposing permanent deregulation of internet-based phone services, and many other issues important to CWA members. She will be a great champion for working families in the State Senate. For years, CWA members have been pushing for stronger protections for airline passenger service agents from passenger assaults. Agents are the face of the airline, and they are often the target of passenger frustration with delays, baggage fees, and other airline policies. Agents have reported being verbally and physically assaulted by customers, including being hit, having luggage and equipment thrown at them, being pulled over counters, and getting spat upon. Now, after working diligently on petitions, letter-writing campaigns, sit-ins, and meetings with members of Congress and the Transportation Security Administration, the hard work of CWA passenger service agents is paying off. Passenger service agent assault protection language has been included in the FAA Reauthorization Act of 2018 that is expected to be voted on by the U.S. House of Representatives tomorrow. If the House passes the bill, it will move on to the Senate for consideration. "With the high tensions that are increasingly common with air travel, passenger service agents face numerous challenges at work, including dangerous situations like verbal and physical assault from passengers," said Richard Honeycutt, Vice President of CWA District 3 and Chair of CWA's Passenger Service Airline Council. "It's time for Congress to pass this important provision to protect passenger service agents." 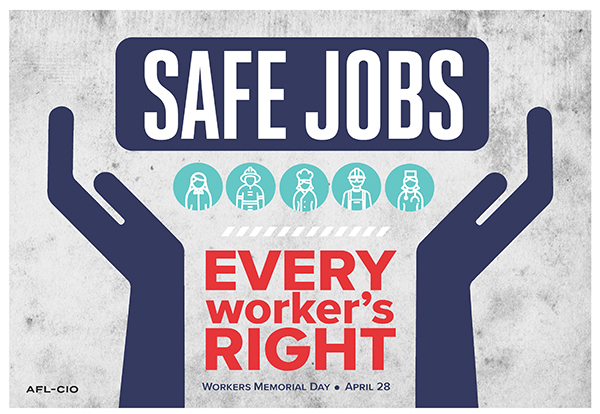 CWA members will mark Workers' Memorial Day on April 28 by remembering co-workers killed, hurt or sickened on the job. With the Trump Administration and Republicans in Congress dismantling workplace protections, the work of CWA members fighting on the front lines to improve, maintain, and promote safety at work is more important than ever. "Many CWA members face job hazards including dangerous, stressful, or risky working conditions," said CWA President Chris Shelton. "President Trump and Republicans have made it their mission to overturn worker safety rules issued by the Obama administration. President Trump has even ordered that for every new protection, two existing safeguards must be removed. CWA is challenging that dangerous, irresponsible executive order in court." "With these threats, now more than ever before, working people need to join together to fight back against employers that cut corners, violate the law, and put workers in jeopardy. We must make certain that our government fulfills its responsibility to keep workplaces and working men and women safe. As we remember those who have been killed on the job, we are renewing our strong commitment to workplace safety and health protections," he said. Ashley Newberry, 34, a member of CWA Local 3808 in Nashville, Tenn., employed as a DIRECTV technician. On February 7, 2017, while driving the assigned company vehicle, he lost control and crashed head-on into an oncoming vehicle. Ashley suffered life-ending injuries from the crash. Brenda Burke, 65, a CWA Local 9509 member in San Diego, Calif., employed as a customer service representative by AT&T. While performing her normal work operations on April 28, 2017, she experienced an upper respiratory attack/severe distress (possibly related to asthma). She was not provided emergency medical care in a timely manner and died. Eric Tucker, 53, a member of CWA Local 1118 in Albany, N.Y., employed as a Verizon field technician. On his birthday, August 20, 2017, he suffered a fatal heart attack while performing telecommunications residential service work. David Dufour, 47, a CWA Local 4100 member in Detroit, Mich., employed as a TFS technician by AT&T. On September 7, 2017, while performing residential telecommunications installation/service work, David suffered a life-ending heart attack. Matt Newman, 62, a member of CWA Local 6215 in Dallas, Texas, employed as a customer service technician by AT&T, passed away on October 5, 2017, from medical complications related to a fall from a vehicle platform bucket, resultant hip replacement surgery, and the occurrence of a blood clot leading to cardiac arrest during the recovery process. Frank Hernandez, 32, a member of CWA Local 9423 in San Jose, Calif., employed as an outside plant technician by AT&T, passed away on January 9, 2018, as a result of injuries sustained in a devastating vehicular accident. Terry Dwayne Higdon, 61, a member of CWA Local 3804 in Jackson, Miss., employed as a Machine Operator for Bell South Utility Operations, suffered a life-ending trauma on January 25, 2018. While performing buried service telecommunication work he was caught in the trenching equipment and killed. Terry's death would have been prevented if the company had assigned two people to perform the work, as recommended by the equipment manufacturer.